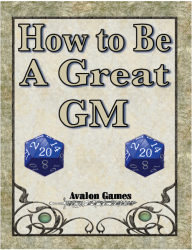 Today I have the opportunity to review the e-book How to be a Great GM, by Avalon games, an easy to follow 26 page guide that makes a great addition to any GM’s tool kit. Like the title says, the book offers solid, system neutral GMing advice (especially to those new to the hobby) and can help improve the quality of most new GM’s games after even a quick skim. While a lot of the advice may be common sense to the more veteran GMs out there, there’s still some helpful tips they may have forgotten or never picked up on (such as keeping backup copies of character sheets in the event a player forgets theirs). The book starts off with a light-hearted approach to GMing, and covers the basics of how to organize your game, familiarizing oneself (and your players) with the setting, as well as covering how to create an exciting adventure that will appeal to your specific group. In the third part of the book, we are given good tips on how to manage interruptions, and how to offer up a good selection of snacks for the hungry group. Introducing new players to your group and handling those with different play styles then you’re used to, is also briefly touched upon. The book concludes with some advice on how to better prepare oneself for GMing, and where to look for quick sources of inspiration and adventure ideas at a moment’s notice. For only 26 pages of text they manage to cover a lot of useful points. Unfortunately, each topic is only briefly touched upon, without going into depth, something those in search of a comprehensive guide will find disappointing. The lack of bookmarks also came as a minor nuisance (and surprise) given they are standard fare for most ebooks. However, copy/paste is enabled, letting GMs cut pieces from the text into their own reference notes if need be. Overall, the book seems geared more towards the beginner GM and written in such a way one can readily grasp the concepts after a single read through, with the added bonus of being short enough most people can get through it in a single sitting. (It took me less then an hour to read from start to finish.) If you’re a new GM or haven’t had the pleasure of GMing for a while and feel a bit rusty, give this book a try, (Available at RPGNow) you won’t be disappointed.